John and Traca Marshall were growing apart. Jackson, 14, wouldn’t put her phone down long enough to talk with her dad, while shy Logan was 17 and headed for college soon. It was time to reconnect, and John dreamed of taking the family and traveling around the world for a year of service. This was not the memoir I was expecting to read. They didn’t have a lot of money, and almost gave up on their dream. Finally, they rented out their Maine house and set out for a half year of volunteering. I thought the trip would be organized well in advance. 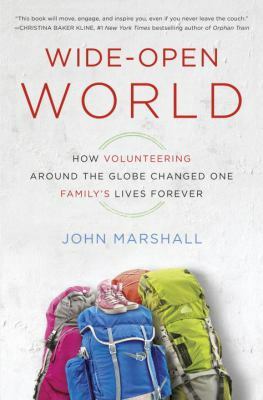 While the author gives practical tips for other families who’d like to volunteer abroad, including how not to rent out your house, the Marshalls didn’t always know where they were headed next. I expected humor, adventure, illness, and increased closeness of the family. No one got sick although John did get attacked by a monkey in Costa Rica, on more than one occasion. They certainly had adventures, traveling to New Zealand, Thailand, India, and Portugal, and the people and settings they visited sound quite appealing. The teens grew and changed during their travels, and are continuing to travel and volunteer. There are some humorous anecdotes, but the family as a whole didn’t reconnect they way they had hoped and not all of the volunteer experiences were positive. A very honest, reflective memoir of a family who followed their dream to make a difference and see the world.